Last Friday, to celebrate the end of the semester, my friend Lorelei and I decided to go out and do something. Eventually we decided to get our eyebrows threaded, as it was something we both desperately needed to have done, and since Lorelei swears by the process, I said I'd give it a try. If you've never had your eyebrows threaded, it is truly an experience. The person working at the salon holds onto a thread with her teeth and both hands (that can't be sanitary, or good for her teeth), and twists and twirls the thread in such a way that it yanks out the hairs. Maybe it would have been easier if I had taken better care of my eyebrows in the months since my last brow waxing, but since they needed an awful lot of cleaning up, it seemed to take forever - and the pain made each second feel even longer. It reminded me of being an undergrad and going to get my eyebrows waxed. I usually get them waxed, because when I try to pluck them, I start sneezing uncontrollably. But when I get busy with school or work, my eyebrows are my absolute last priority, and so my finals week treat would always be to go get cleaned up. There was a beauty salon in the plaza across from my dorm and the owner offered a discount - $4 brow waxing for students. Perfect! Without fail, though, every time I would have my brows done, the woman who took care of waxing would apologize profusely for how much it hurt. Maybe I flinched a little, but it wasn't painful - not to the point where this woman needed to apologize literally a dozen times. It was more of a reflex than anything else. Pain is a really interesting thing. Everyone perceives pain differently based on previous experiences with it. 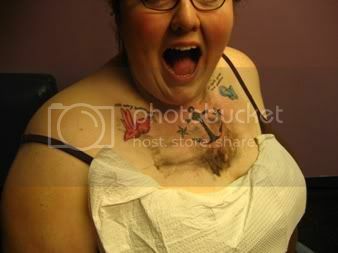 Getting my eyebrows waxed is totally minor to me, especially since I have lots of tattoos (many of which are in very painful places) - the winter of my senior year, I finally told the woman, "Ma'am, I have a giant anchor tattooed on my chest. This does not hurt me." And she chuckled and proceeded with the waxing, only apologizing once or twice. Eyebrows? Insignificant. Tattoos on the tops of my feet? I was gripping the chair, I sweat through my clothes, and I uttered quite a few unlady-like curses. This past week, I have been running week 8 of C25k - a five minute warm-up walk, followed by a 2.75 mile run, then five minutes of cooldown. I made the mistake of trying to run on Monday, the day after my 8k race - sure, it was just walking, but my legs needed to recover afterwards, so I had to stop after 1.25 miles. I had a strange feeling in my knees, and I'm not sure if it was pain. Yesterday, I went back to the gym and tried again, and I managed to get the full 2.75 miles done, but the same feeling was back in my knees. It didn't hurt the way getting tattooed hurts - it didn't even hurt the way eyebrow waxing hurts. It was more of a tired feeling than an excruciatingly painful one. But still, it concerned me. I know it isn't right to compare running to knowingly torturing innocent people - up to this point, and including now, I totally love running. But I kept having to push myself to keep going - just get to one mile, you have to do at least that. Just get to a mile and a half, you really need to try and do that. Just do two miles, you've already done so much. Just finish, then you can move forward. I needed more recovery time after Sunday, so Monday's run wasn't great. And to follow any running on Monday with more running Tuesday may have been a mistake - you need to take days off between runs to let your body recuperate, especially as a new runner. So hopefully my next run (tomorrow) will be better - I'll be physically rested, at least. It will be my first run in Connecticut, so we'll see how it goes. Hopefully no pain on any front. I have heard that the threading really hurts! I've got nine tatts, and I think that we tatt people generally like the pain a little bit. Running is the same way: You learn to like the pain. You push yourself, and it feels good. Try convincing yourself on your next run that you like pushing through the tought parts. Also, if it feels too tough, slow it down a little. The slower you go, the longer you'll last. I started out runnning at a 20:00 pace. Six months later I finished a 5k with a 9:05 pace. Don't push too hard every run. I'm glad yo uhad so much fun getting your eyebrows done! Would you describe the discomfort in the back of the knees as cramps? How long did it take to have your eyebrows done? I get mine waxed and I've heard of threading but never did it. Is it more beneficial than waxing? To me, it would've been easier to just wax them. Was it cheaper to thread? Fill me in! Very curious~! Threading eyebrows is also new to me, though I do have my backhair braided about once a month. Good job on the run. Sticking with it, amidst the pain, is the sign of a true athlete. I am also a new runner and I have had my share of pain. Shin, knee, foot, hip. Pay attention to it, but it doesn't have to sideline you. Keep moving forward but allow yourself to rest an extra day if the pain lingers after the run too much. You are doing great. I have tattoos also, but I HATE having my eyebrows waxed. Never heard of threading. Sounds way worse! I am such a baby when it comes to pain - IF someone else is making it happen. I like to be in charge of my own pain, I guess. So, probably no tats, piercings, pluckings or anything else by other human hands in my future. I had my eyebrows threaded for the first time a few weeks ago and yes, it does hurt! I think it looks better though and my little brow hairs grew in nicer than with waxing. Waxing for some reason makes my hairs grow in kinda wavy/curly. The threaded hairs grew in straight. Weird. Do you have pics of your tatts on the blog? I'd love to see them. I'm working on the design for my first tattoo.